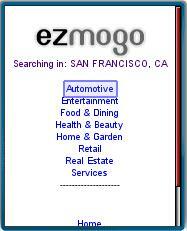 ezmogo is a mobile web service that lets you search for discount coupons and special offers on services, entertainment, retail stores, restaurants, and more in the U.S. Similar sites include Xtra! Coupons and PocketDeal in the U.S. and ActiveDeals for India. There are two ways to find coupons with ezmogo. You can browse through categories of offerings for your location or you can enter a “Quick Code” found on an ad, flyer or poster. To redeem a coupon just show it displayed on your phone screen at the point of sale. You don’t have to register to use ezmogo but registered users can save coupons for quick access and forward them to friends by text message. Registering requires giving your mobile number to ezmogo. I think mobile coupons are a viable business model but ezmogo is currently not very useful due to a combination of lack of inventory and user interface limitations. Without a quick code using this site is an exercise in frustration. After setting my location to downtown San Francisco, I clicked of each of the 29 shopping categories and sub categories only to be greeted by “there are currently no ads available in your location in this search category” for each one. Categories need to be hidden if they are empty to avoid leading users “down the garden path” to disappointment. This entry was posted in Site Reviews and tagged coupons, mobile site review, mobile usability, shopping by Dennis Bournique. Bookmark the permalink. There’s absolutely no reason not to use coupons. I’ve become very fond of them, especially lately with prices in the grocery skyrocketing. Why wouldn’t you use coupons, its like free money!